The charming, Kath and Andrew opted for a feathers and antlers themed wedding. 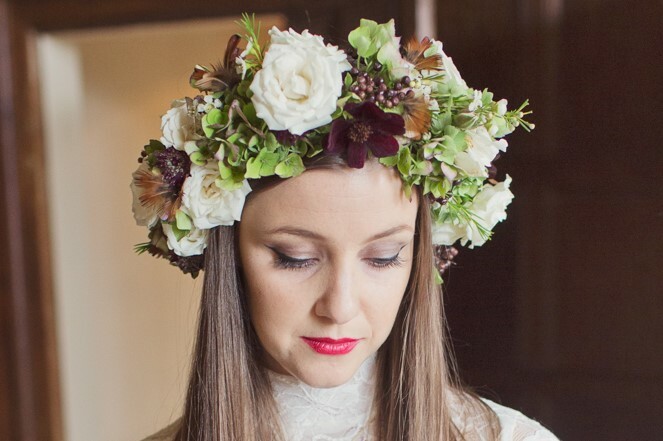 Beautiful autumnal, red and purple flowers that spread throughout making huge bouquets, table dressings, they even ran through the arched twigs that stood at the altar right through to a beautiful flower crown, worn by the bride herself, courtesy of Maria at Sorori Design. The whole theme had a quirky yet exquisite feel about it. Katharine stayed at a stunning, georgian townhouse called No38 The Park in the heart of Cheltenham, the night before her wedding. The bedroom was huge and absolutely stunning perfect size for Katharine and her lovely bridesmaids to get ready in alone with and the talented hair stylist Margarida and myself on make up. The lovely couple were married at the incredible Elmore Court a place that offers a touch of magic. Katharine chose a vintage style dress, with this in mind Katharine wanted vintage meets modern make up. Katharine is all about her winged eyeliner a favourite style of mine. Katharine wanted a slight rock chick feel to give the look an edge but still to keep it quite subtle. Hollywood red lipstick was applied along with a soft taupe eyeshadow. Thank you Katharine for choosing my services, it was an absolute pleasure to meet you and your girls.